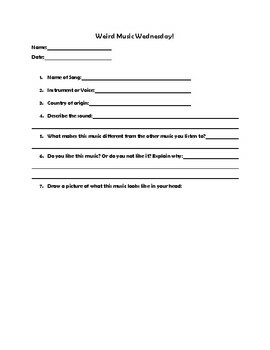 To help expose kids to a variety of musical cultures, backgrounds, and musical styles, I created this worksheet as a simple, consistent, and easy-to follow (and grade!) assignment. All you need to do is print the worksheet for your kiddos, play a video (I have a list from YouTube of some of my recommendations), and have them complete it! I also have a list of music terms that I make my students (6th grade) use to broaden their musical terminology and ability to speak about music intelligently. It‘s remarkable to see how far they come from the beginning of the semester to the end, and the way they talk about music after doing this exercise for a few months.